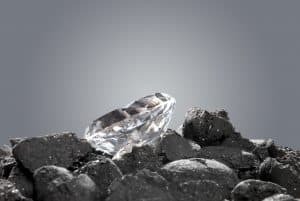 A Diamond in the Tough: Resilience is Refinement. When have you taken the time to recognize and acknowledge those deep, dark times you have pushed through? When have you have been tested at your highest level of adversity? It’s in those times that you find out… does adversity make you bitter or does it make you better? Where are you when you’re pushed into a corner and you think you cannot move on? I’ve been there, and when I sit back and celebrate all the great things that life has given us, I realize one of the greatest gifts I’ve been given is the refinement of who I am as a person. Who are you? Do you know? Have you allowed yourself to be refined through the trials and tribulations of your life? Each of us is a diamond. A diamond that is waiting to be refined. It’s in your resilience and your self-efficacy that you become refined. Part of this journey in owning and honoring your resilience and recognizing those tough days. I just had one recently, where I was tired, torn, and tearful. I was tired from all I was doing to serve the world. I was torn because I still didn’t know, “Am I living my calling?” I was questioning every decision, every step forward. I was hoping to get a sign. And then I was tearful– from joy, or exhaustion, or both. These are the 3 defining moments I believe we all experience. Men and women, it doesn’t matter our age. As human beings, we all have those rough days. Instead of running from them, I believe it is those days that refine us. Own them, acknowledge them, and do something with them! Sometimes it’s the biggest sign to stop and pause and take pure quiet time to reflect and renew on who you are and what’s causing all of this confusion. These are the days of refinement for my soul. Look at the people around you. Or maybe people who are no longer living but you’ve always admired. Take a couple minutes and write down 5 people that you admire or think, “Wow, they have something spectacular.” Whether you know them well or you know them very little, find out what their life has been about. I guarantee you it has been full of trials and tribulations and the adversity has refined them into an extraordinary person! So stop running from it. Stop burying it. Stop ignoring it. Acknowledge it, own it, and then celebrate it and realize that this is the fuel that keeps you moving forward. This is the fuel that has refined you. This is what makes you a Diamond in the Tough! Learn more about Global Keynote Speaker & Inspirational Thought Leader,Holly Dowling, by visiting www.HollyDowling.com and connecting with her on Facebook, Twitter, & LinkedIn.